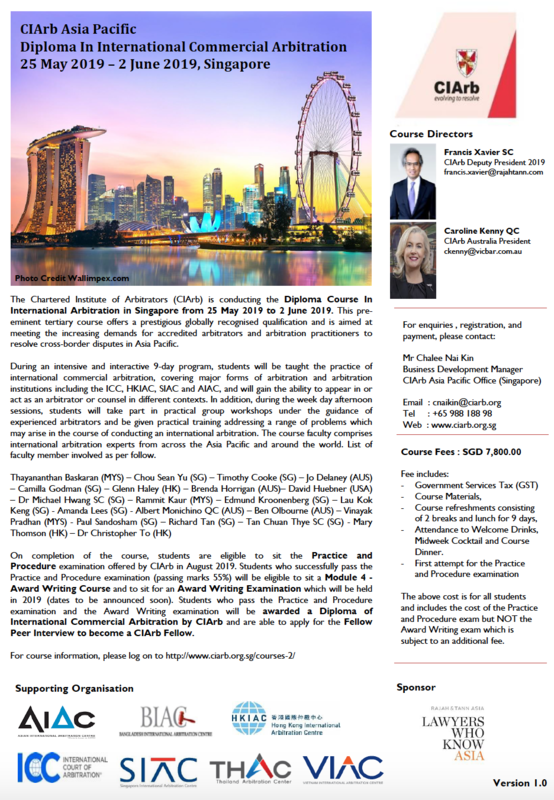 The Chartered Institute of Arbitrators (CIArb) is conducting the Asia Pacific Diploma Course in International Arbitration in Singapore from 25 May 2019 to 2 June 2019. This pre-eminent tertiary course offers a prestigious globally recognised qualification and is aimed at meeting the increasing demands for accredited arbitrators and arbitration practitioners to resolve cross-border disputes in Asia Pacific. During an intensive and interactive 9-day program, students will be taught the practice of international commercial arbitration, covering major forms of arbitration and arbitration institutions including the ICC, HKIAC, SIAC and AIAC, and will gain the ability to appear in or act as an arbitrator or counsel in different contexts. In addition, during the week day afternoon sessions, students will take part in practical group workshops under the guidance of experienced arbitrators and be given practical training addressing a range of problems which may arise in the course of conducting an international arbitration. The course faculty comprises international arbitration experts from across the Asia Pacific and around the world. On completion of the course, students are eligible to sit the Practice and Procedure examination offered by CIArb Australia, CIArb East Asia, CIArb Singapore and CIArb Malaysia in August 2019. Students who successfully pass the Practice and Procedure examination (55%) will be eligible to sit a Module 4 - Award Writing Course and to sit for an Award Writing Examination which will be held in 2019 (dates to be announced soon). Students who pass the Practice and Procedure examination and the Award Writing examination will be awarded a Diploma of International Commercial Arbitration by CIArb and are able to apply for the Fellow Peer Interview to become a CIArb Fellow.